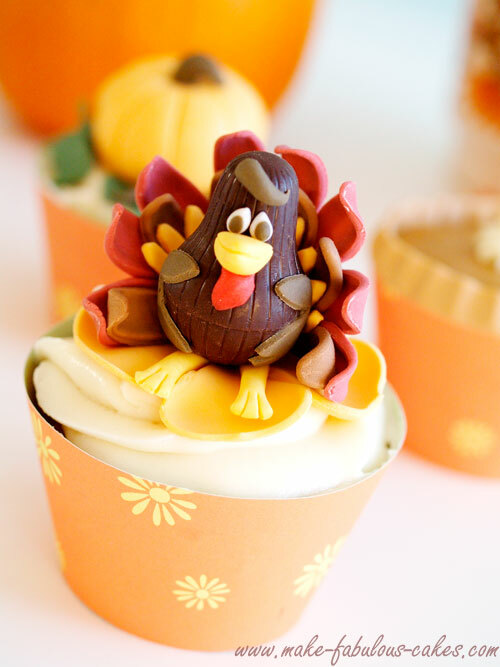 It’s going to be Thanksgiving very soon for my American friends and to celebrate this special occasion I made these Thanksgiving cupcakes. 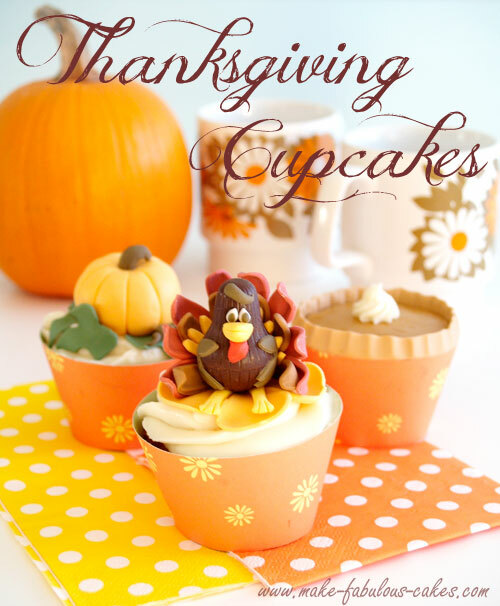 The cupcake toppers I made are what you will find in a typical Thanksgiving meal – turkey and pumpkin. So, let’s start off with the turkey. The inspiration for this turkey came when I was in the drugstore aisle and found some liqueur chocolates. When I showed my daughter the chocolate pear, and said ‘This is the perfect turkey!’, she just gave me a look that I must have gone crazy. But whatev. Be warned though that these chocolates have alcohol and should not be given to children. 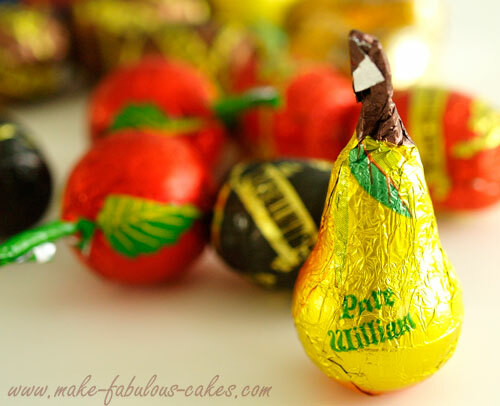 You can use fondant instead and shape it into a pear. 1. Use the PME Veined Sunflower, Gerbera & Daisy Cutter on burgundy red fondant to cut out shape. Cut the flower in half. 2. Thin the petals using a pointed stick gum paste tool. 3. Curl the petals inwards. 4. 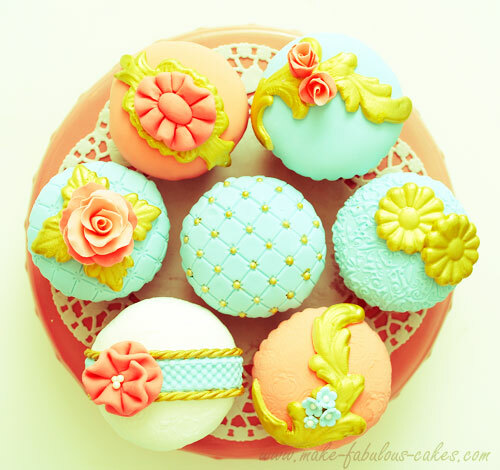 Do this same using a brown colored fondant. Use fewer petals this time and attach to the other with water. 5. Cut another feather shape using a gum paste flower cutter on yellow fondant. 6. Attach to the other ‘feathers’. 7. Use the Wilton Fondant Daisy Shape Cut Outs to cut out the ‘arms’. 8. Attach it to the chocolate. 9. Use fondant to make the details of the face. 10. Make the legs with yellow fondant and cut the feet with the exacto knife. 11. Carefully attach the feathers to the body with some water. 12. Use cotton balls as support while drying. A perfect ending to a thanksgiving meal is the pumpkin pie. 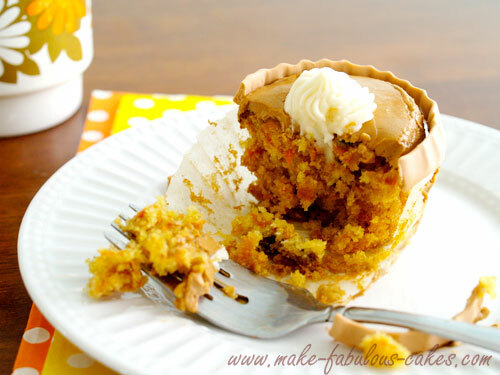 Why not make pumpkin pie cupcake to change things up a little bit? 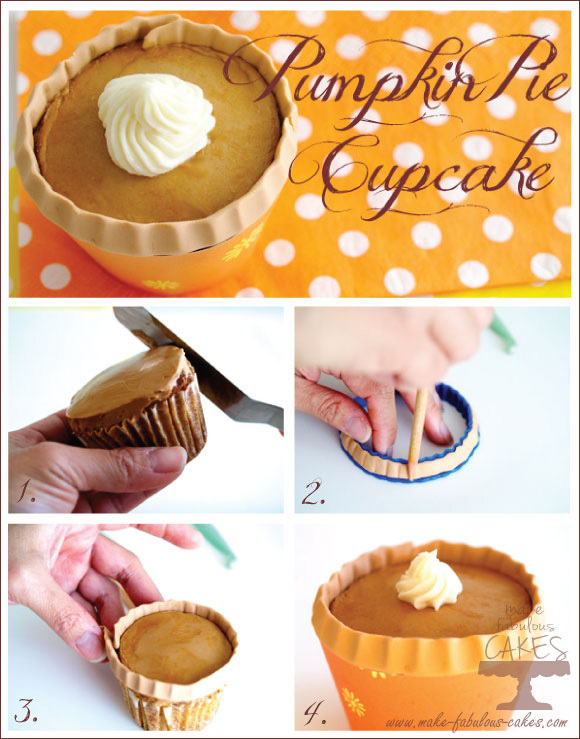 You can use the pumpkin cake recipe to make the cupcake part. My pumpkin pie cupcake looks as rustic looking as my pumpkin pies. I really need more practice on crimping the crust. I used a scalloped cookie cutter here to keep the crust in scale with the cupcake. 2. To make the ‘crust’ of the pie, roll a rope of light brown fondant and press it to the side of a scalloped cookie cutter to make the impression. 3. Attach the ‘crust’ to the cupcake. 4. Pipe white buttercream or whipped cream on top to finish it. Pumpkins are one of the last harvests of the season. 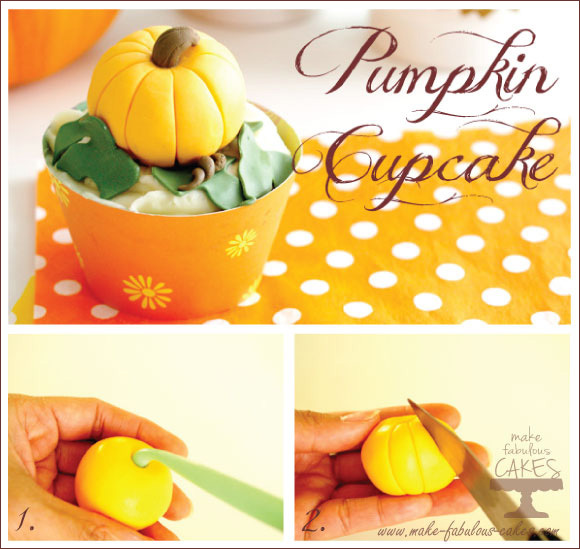 Making a pumpkin topper with fondant is super easy. 1. Make a ball shape with the orange fondant. Flatten to top and bottom a bit to resemble a pumpkin. Use a bone tool to make hole on top. 2. Use the knife to make the indentation on the sides of the cake. Use the brown fondant to make the stump and attach it in the middle of the pumpkin. I hope that this Thanksgiving will bring you warm memories and many things to be thankful for.